I wondered that two years ago when I decided to learn computerized patternmaking. 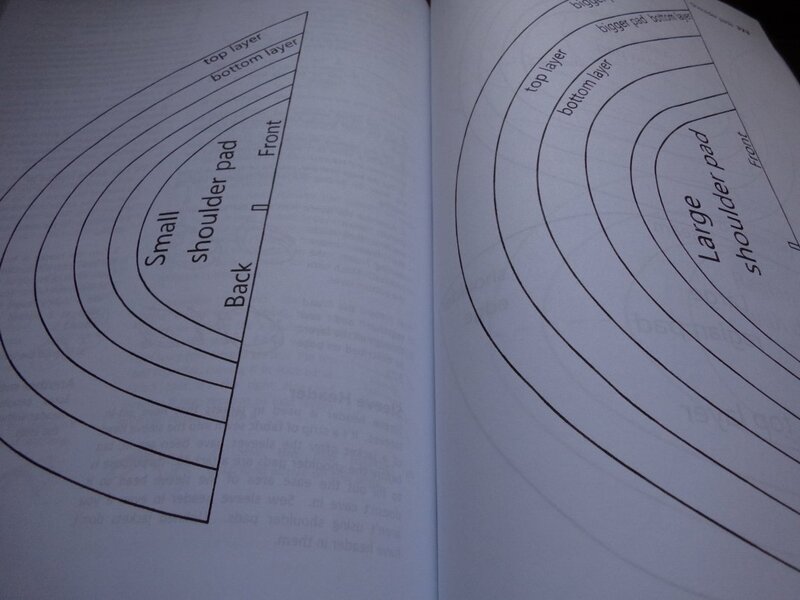 In 1990-91 when I did my patternmaking training, patternmaking software was rare and expensive (it’s still expensive). I learnt to make patterns Old School, and since I never worked anywhere that used computers, I remained Old School. The software I bought is a Greek system called Telestia Creator. I believe it’s a computerized version of a manual drafting system using special rulers; the rulers are still in the software as some of the drafting tools but I’m comfortable with my own way of flat pattern making. Telestia came in three modules: fashion design, pattern construction and grading, and I bought the last two. There was also an extra (which I didn’t get) where you can plug in someone’s measurements and the computer will spit out a customized block. I’ll be honest: I found it hard. But whether this was due to the software or my own total inexperience with CAD I cannot say. I found it it clunky, non-intuitive and I actually had to think in a completely different way to make a pattern. The order of working and the thought processes are all so different from manual patternmaking. My husband would calmly listen to my rants as I wrangled with it, and say Well, that’s CAD for you. Telestia came with a help/lessons part that I worked through to learn, but the real lifesaver was the excellent customer helpdesk. I cannot praise them highly enough! They politely, throughly and promptly answered my questions, and because our time zone is ahead of Greece, later-in-the-same-day replies happened easily. The customer help has no expiry date, either. The software has had significant updates since I bought it and is now easier to use (and of course I’ve gotten better at using it). 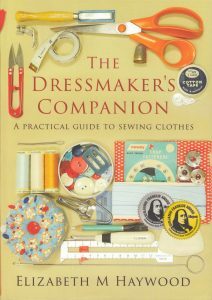 I used Telestia to draw the nine simple patterns that appear in The Dressmaker’s Companion. I had initially thought when I bought Telestia that it would be easy to import existing patterns I had into the system, but actually it isn’t. The method for importing is to photograph the pattern piece, then draw over the top of it in a new layer using the drawing tools (same as you can do for Illustrator). However, no matter how clear the photo, it always looks fuzzy around the edges when it’s brought up on the screen. I found it’s much more accurate to use blocks or patterns which are in the system from the start. Telestia comes with a complete set (trousers, skirt, bodice, sleeve etc) but I preferred to draw my own according to the sizing and fit of my choice. I’m not used making patterns with blocks which have no seam allowance! In fact, I haven’t done this since I was a student. Industry patterns always have seam allowances on them (since they’re actual patterns -the patternmaker just takes the seam allowance into account). The software makes it possible to produce very accurate patterns (although this depends on how accurate the user is, of course!). Seam lengths, for example, can be measured to 1/10th of a millimetre. I couldn’t say whether or not I’d recommend Telestia, because I’m too inexperienced with CAD systems. If you’re not used to it, it’s very hard to start with, particularly without a teacher over your shoulder. I quite like using it now, however. If you’re thinking you need to buy patternmaking software to improve your patternmaking or make it easier, think again. It’s a tool that’s only as good as you are. You already need to know how to make patterns. 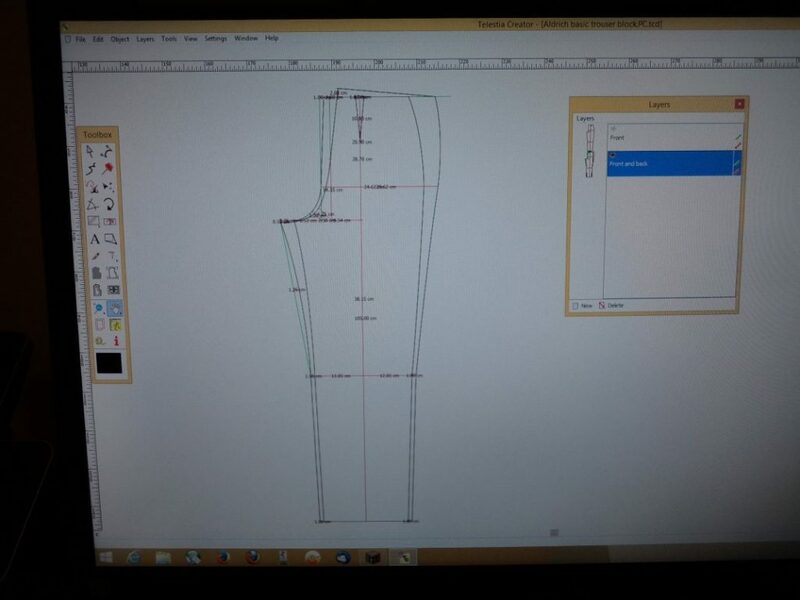 The software obviously won’t help you with other patternmaking skills such as fitting or deciding on construction. Plenty of small fashion businesses still use cardboard patterns, especially if their making is done in-house or locally. It’s hard to try-before-you-buy and make an informed decision on software. Price is definately a reliable indicator. The cheaper the program, the more mouse clicks you’ll need to perform the same function. There’s a free open-source patterndrafting tool being developed called Valentina, which was too new for me to consider two years ago but has come along since. I’ll admit that part of the attraction of patternmaking for me is the stationery. Mechanical pencils, felt tipped markers, staplers, hole punches, transparent rulers, craft card, perfectly sharp scissors…love it all.